Nicole Trahan wasn’t a practicing Catholic growing up, and she didn’t hear about the Marianists until after college. But at age 38, she took final vows and became one of them. Nicole Trahan’s path to becoming a member of the Daughters of Mary Immaculate — the Marianist sisters — wasn’t direct. Although she attended Catholic school through high school and was involved with retreat teams and youth groups, religion didn’t take a prominent place in her family. She didn’t think about becoming a nun. Trahan (M.A. ’02, M.A. ’11) studied biomedical sciences at Texas A&M University, and she served on liturgical teams and sang in the choir at St. Mary’s Catholic Church, the local parish providing campus ministry for the university’s Catholic students. But it was her work at the church’s Catholic Center that she was most passionate about. Not sure of her life’s direction, Trahan spent the next several years exploring different opportunities in search of what would ignite her passion. She volunteer-taught several grade levels and disciplines to economically disadvantaged students at a Catholic elementary school in Uvalde for a year. Then, she enrolled in the St. Mary’s University Catholic Leadership Program after a chance meeting with its director and even began a second master’s degree in Pastoral Ministry to bolster her educational background. Trahan began teaching religion at Central Catholic High School around the same time. Though she wasn’t familiar with the Marianists, it was as if Mary was illuminating Trahan’s path all along. Teaching at Central Catholic, she learned about The Marianist LIFE (Living in Faith Experience) program for high school students — a weeklong immersion in the Marianist charism. She introduced it to her students, but it also brought Trahan closer to finding her own niche. She was invited to join the national LIFE team, and for the next eight years she helped to plan and direct the program. Still, pursuing religious life was not yet apparent until she returned to the St. Mary’s Catholic Center in College Station and met students considering religious life themselves. Several things became clear to Trahan as she began to consider religious life in earnest. She realized that, for her, living and praying alone was not “life-giving.” She attended a campus ministry conference attended by many Marianists, and she realized how much she enjoyed them being part of her everyday life. She went on a discernment retreat in 2005 with a list of reasons religious life would not work for her, but none turned out to be valid. At this point, Trahan had a pretty good idea where she was heading. 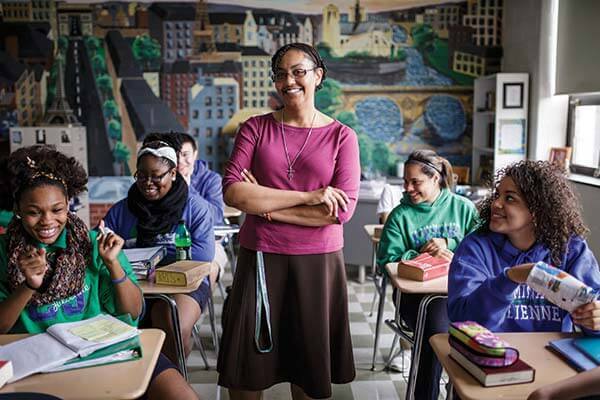 Today, Sister Nicole Trahan, F.M.I., teaches religion at Chaminade Julienne Catholic High School in Dayton. She’s also vocations coordinator for all Marianists in Dayton and national vocations director for the sisters. She acknowledges that in the future it is likely religious congregations will be significantly smaller than they have been in the past, but for her that’s OK.
Trahan admits that not many GenXers like her went into religious life because “we were taught individualism, to make our own way.” But she sees more Millennials considering the possibility. She had to leave behind her individualism, but she’s gained a broader worldview. Trahan see herself as the new face of the professed religious? Well, yes and no. “Many people entering religious life now are graduating from college, going out into the world, like I did, and getting work experience. Many are minorities. And many enter religious life for prayer and community life, not necessarily because of the group’s mission. I fit that general trend.” But, she continued, people who consider entering religious life have some things in common, but each person’s path is unique.